I would like specific information on: immunoproliferative small intestinal disease. I am a practicing Medical Oncologist, and would be grateful if I could get the latest on the disease. Immunoproliferative small intestinal disease, also called Mediterranean lymphoma, is the most common lymphoma diagnosed in the Middle East and Africa. It affects primarily young patients with a median age of 30. To establish a diagnosis of immunoproliferative small intestinal disease, or any primary gastrointestinal tract lymphoma, there must be an absence of peripheral or mediastinal adnopathy and a normal white blood cell count. More than half of patients with Mediterranean lymphoma present with an abdominal mass. A triad of signs/symptoms at presentation has been classically described and includes abdominal pain, nail clubbing and malabsorption. Immunoproliferative small intestinal disease usually involves the entire small intestine as the disease infiltrates and spreads throughout the mucosa of the small bowel. A diagnosis can usually be established by endoscopic biopsy of the second part of the small bowel (the jejunum). Chemotherapy is the mainstay of treatment. 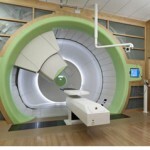 However, there are reports of successful utilization of whole abdominal radiotherapy. Surgery is usually reserved for symptoms such as obstruction, bleeding or perforation.